This is the crack in my garden wall. Yes it needs fixing or else there's a good chance the wall will topple over and potentially hurt someone. Obviously I don't want that. But, the thing that's causing the crack is probably the roots of my lovely forsythia bush. Right now, as you can see in the picture, it is a blaze of beautiful yellow flowers - as it is every springtime. This is probably something I will have to sacrifice. 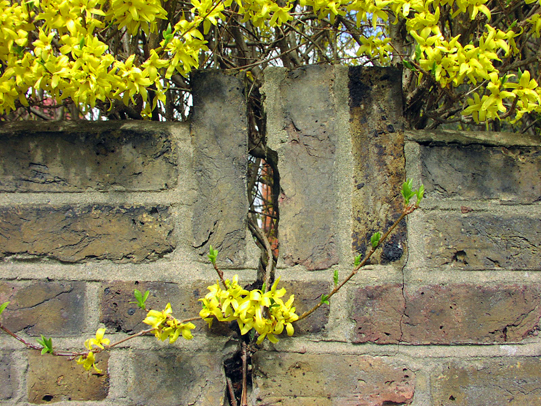 I have been told that before the wall can be mended I am going to have to cut down the forsythia and dig up the roots. And, unless I want to run the risk of the same thing happening again in the future, I can't grow another forsythia hedge there to replace it. This is something I feel very sad about. Not only has the sight of cheerful yellow blossoms lifted my heart every year for decades, it also reminds me of my mother as she was the one who planted the forsythia there in the first place. She got a small plant a garden centre had discarded because it was past its best. She planted it in the front garden, tended it and watched it grow. She loved the brightness it brought to the garden as much as I did. But safety has to come first. In the city there needs to be a balance between natural growing things and providing the right environment for people to thrive in too. I'm not going to give up on the forsythia completely though. I will take cuttings and plant some in my back garden and some in tubs. Hopefully it will thrive and in future years I will still be able to enjoy the spring spectacle it offers.